This is the only paleo vanilla layer cake recipe you’ll ever need! It’s easy and requires 2 bowls and a whisk to make. It’s rich and just sweet enough, with a tight, moist crumb – just like a vanilla cake should be. Keep this versatile recipe on hand, because everyone loves this cake! 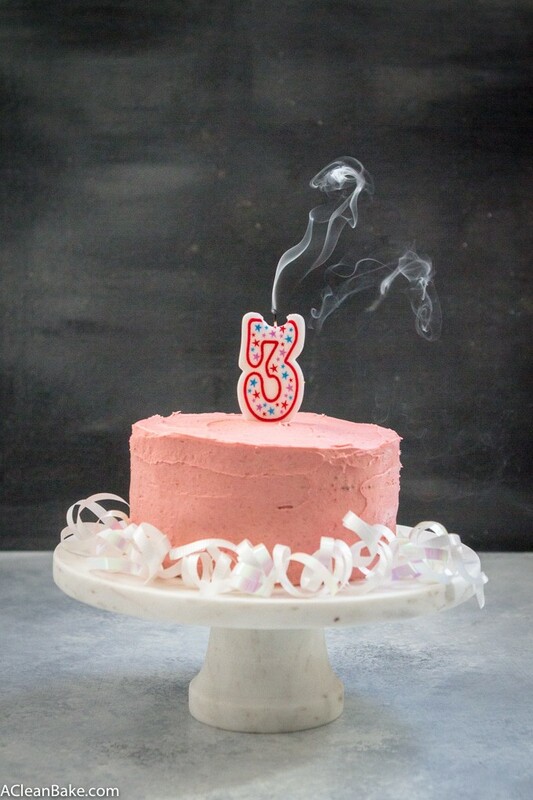 If the conspicuous candle on top of the cake didn’t give it away…. it’s the third anniversary of A Clean Bake! I love this. I can’t wait for the next three years, and the three after that, and on and on. Thank you. You, there, the person whose eyes are flickering over these words right now: I’m talking to you. Thank you, truly, for another year of following, reading, commenting, emailing, and baking with me. I’m so damn sick of cake. My love letters usually come from 6″ round cake pans or cookie sheets, so know that when I asked you on Facebook what kind of cake you most pined for, and you surprised me by answering with a request for a simple vanilla layer cake (If you didn’t vote and want to in the future, make sure you have liked the Facebook page! ), I resolved to give you the best damn paleo vanilla layer cake there ever was. We have a bunch of sugar free vanilla cake recipes around here, but this one takes the… ahem… cake. (oof, I’m so sorry I had to do that, but I really backed myself into a corner). The others are good too, of course, but this one is uniquely moist and fluffy, rich with a tight crumb and just the right about of spring to it. The secret is coconut sugar which, though I usually use stevia or monk fruit, I know many of you prefer to bake with and keep on hand. And I desperately want you to try this cake – yes, I am putting my desperation front and center, because a slice of this cake is worth sacrificing a slice of my dignity – so it is made out of ingredients that, I hope, you can pull out of your cabinets right now. Many of my essential baking ingredients from NOW Foods, including coconut flour, tapioca flour, coconut oil, cocoa powder, and coconut sugar. Simple Mills frosting, which is conveniently ready-made, but is also gluten, dairy and grain free, paleo-friendly and made from real food. Simple Mills’s new ready-made cookies, to snack on while you bake! Ellyndale Organics’s new Q-Cups, which offer the convenience of ramen, minus all the garbage, plus real food – since, I suppose, we should eat some dinner before cake. Bonus: A few of Ellyndale Organics’s line of premium oils. Have you cooked with brazil nut oil or avocado oil yet? Well, if you win, you get to start! Let’s pause to give the sponsors of this giveaway a huge round of applause for their delicious and incredibly good quality products. Thank you, NOW Foods and Simple Mills! So before I sign off and let you get back to your weekend, I have to say one more time: Thank you. All this is possible because of you, and I can’t wait for year four of Clean Baking together! This is the only paleo vanilla layer cake recipe you'll ever need! It's easy and requires 2 bowls and a whisk to make. It's rich and just sweet enough, with a tight, moist crumb - just like a vanilla cake should be. Keep this versatile recipe on hand, because everyone loves this cake! Preheat the oven to 350F. Generously grease or spray two 6" round baking pans and set aside. In a medium mixing bowl, lightly beat the eggs, then whisk in the oil, milk, vanilla and vinegar. Set aside. In a large mixing bowl, whisk together the almond flour, coconut sugar, tapioca flour, baking soda, and salt. Pour the wet (eggs, etc) mixture into the dry (flours, etc) and stir to combine. Make sure to scrape the sides and bottom of the bowl to make sure everything is well incorporated. Divide the batter evenly between the two prepared baking pans. Gently smooth the batter into an even layer. Bake for 25-30 minutes until the tops are golden and the cakes are firm. Remove the cakes from the oven and allow them to cool for 20 minutes, before removing them from the pans and transferring them to a wire rack to cool completely. In a small food processor, pulse the strawberries several times until they have been ground to a fine powder. In a medium mixing bowl, fold the strawberry powder into the frosting until the frosting is completely pink and no white streaks remain. Place a dollop of frosting on the cake plate. This will help secure the cake while you decorate it. Add one completely cooled cake layer, upside down, on top of the dollop of frosting. Add the strawberry jam in a single layer. Then place the second cake, face down, on top. 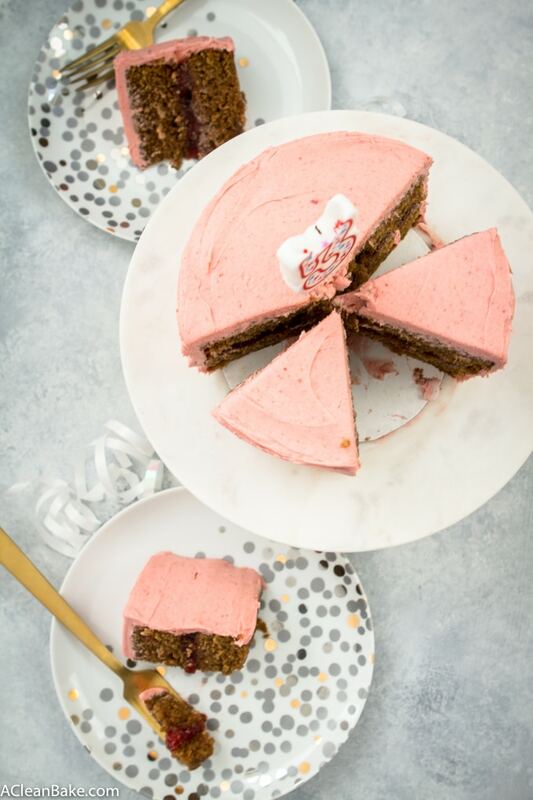 Frost the cake by putting a large pile of frosting on top of the cake and then use a butter knife or offset spatula to work it across the top and down the sides. Add more frosting as needed, and keep working it outward and downward, until the entire cake is covered. Serve immediately, and store leftovers in an airtight container in the fridge for up to a week. This recipe was tested using unsweetened almond milk and 2% dairy milk. I would recommend using a nut milk, soy milk, rice milk or dairy milk. I would not recommend canned coconut milk, which might affect the texture and baking time. Tapioca flour is sometimes labeled tapioca starch. 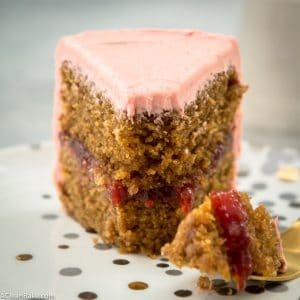 To remove cakes from the pans: run a knife or thin rubber spatula around the edge to separate the cake from the pan (it should have pulled away from the sides slightly while it cooled) then turn it upside down on the wire rack and firmly tap the bottom of the pan until the cake releases. For the vanilla frosting, you can use any recipe you prefer, or - for a ready made option - use Simple Mills vanilla frosting. The strawberry flavor in the frosting is subtle. 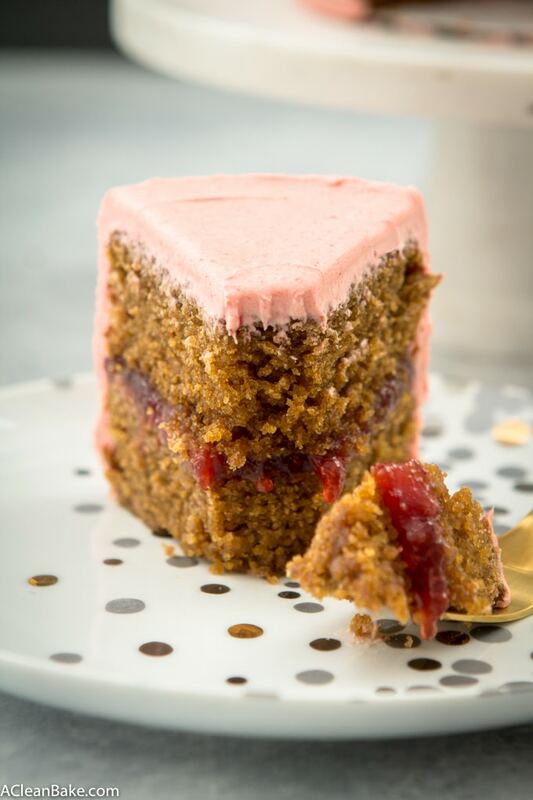 If you'd like a stronger strawberry flavor, you can add a few drops of pure strawberry extract, like this one, to the frosting. As written, this recipe makes one 6" double layer cake. This recipe can make one 9" single layer cake, if you prefer, but you'll have to increase the baking time. Double the recipe to make a 9" double layer cake. I’m a closet-cook and I love how your recipes cater to varied dietary restrictions while being delicious nonetheless and beautiful pictures. I’m glad the recipes work for you! Happy Anniversary! I love coming to your blog not only for great recipes, but I’m also encouraged to continue in a healthier path. It takes a lot to get here! 1. I love your recipes. 2. The cake photos on you Instagram make me dream of baking immediately. 3. you are a lovely person. 5. This is a fabulous recipe! That cake looks amazing! Happy anniversary! I come to your site to find healthier options for treats that can help me stick to a healthy diet by giving me options for a treat now and then without blowing all my progress or starting cravings again. Thank you! Makes a lot of sense. Thank goodness for healthy treats, right?! I really enjoy coming to your blog for paleo/grain-free recipes that I can make knowing I won’t feel awful afterwards. You have some of the best dessert recipes and baked good recipes, and I really love your photography as well! Isn’t it amazing not to need a nap after eating a piece of cake? 🙂 I’m so glad you like the recipes! Thank you! I have a friend who has Celiac disease, but I’ve enjoyed experimenting with “healthy” baking for a long time. I am a mom of 2 and I come here for healthy recipes. That’s great to know, Kelly! I hope to start posting more kid friendly meals soon. HAPPY 3 YEARS!!!! I can’t wait for the next 3 years of recipes from you, either 🙂 I am SO IMPRESSED with your dedication to this cake, and can’t wait to give it a shot. I come here because your recipes are always AMAZING, and I can easily find something fab to make that so easily fits into my GF/DF/SF life. Keep up the good work, girlfriend! Thank you!! Definitely let me know what you think of the cake! I wish you were closer – I’d drop off a couple of slices for you! I love new paleo recipes that is why I am here. Awesome, glad you’re here Manda! Happy Birthday….and many, many more! I come here because I care more about clean nutrition than my hubby, and I can always find recipes that we will both love eating, but that don’t compromise his tastes or mine. Thank you so much! I’m so glad you have found recipes that you both enjoy! Totally hear you, Margo, and it can be tough! I hope you are finding plenty of recipes here that you love, and if there is ever anything specific you’re looking for, you can always email me! Been learning to bake healthy. Thanks for you help! If I’m going to live a long time no more store bought baked goods for me. I started coming here for me—I’m a cancer survivor and started eating keto as a form of treatment after my diagnosis. Now, I have a diabetic hubby and other family members with health issues…and they all keep telling me that they “can’t eat like you do.” Your recipes help me to convince them otherwise. So I’m sneaky. I make one of your delectable recipes, and they are so surprised when they discover it’s not full of crap (and therefore neither am I)! Keep ’em coming–I’m converting my family, and keeping myself on the sweet and narrow! Hello and a very happy birthday keep up the awesome work you do to help and inspire us to eat intelligently with our eyes as well as our mouth. I have a reputation for sneaking healthy things into my treats. I love finding healthy recipes that everyone loves! Thanks for the recipe and the giveaway! Also thanks for taking one for the team and testing all of those cakes- yes I’m jealous! I come here looking for treats that won’t punish me for days afterward! It’s a tough job, but someone has to do it! 😉 I love the way you phrase that: “treats that won’t punish you for days”. Happy 3 years!!! I come to your website because I love food and I love that it can taste great with clean healthy recipes!! Thank you! That’s great to know! I hope you’ve found plenty of recipes here that you love! I come here because your recipes are great and have helped get my husband off insulin. Oh that’s great! Thanks for letting me know, Kris! Thank you for providing healthy and so delicious recipes! I love trying new recipes and that is why I visit. Oh that’s awesome! Happy-almost-birthday to your daughter! I come here for your witty recipe lead-ins and because you have made me a believer that healthier baked goods don’t need to sacrifice delicious-mess! Thanks for always being my recipe guinea pig! congratulations on creating a successful blog! this cake looks fantastic, and if it wasn’t already 8:45p, i’d pull out everything i already have in my pantry–yay and thank you for using coconut sugar!–and make it. that will be tomorrow’s joy! This cake looks AMAZING! Hoping to try it for my birthday coming up. I love your site because when my diet became Paleo, I craved sweets and baked goods. Yours are so delicious! Thank you so much! Happy early birthday! Something about myself = I can’t eat gluten, but I love baking fun treats for family get-togethers that have at least some redeeming health qualities. Why I come to your site = fabulous mix of wholesome and balanced indulgence recipes (cooking AND baking), great writing, eye-catching photos; and of course I’ve enjoyed our chats on Instagram regarding high quality ice cream. I appreciate your passion for A Clean Bake and your correspondence – you care about your readers and the content you create. Looking forward to more wonderful posts as a loyal reader! This is great! I love hearing all about you, Liz. I really enjoy our chats too, and your ice cream recommendations. You have excellent taste in the frozen stuff 🙂 Thanks for continuing to read and follow! I have been ona gluten-free and dairy-free diet for the past 3 years. Love seeing what you’re up to for new ideas! this looks amazing! something about me – well this past weekend I completed my third half marathon and got a new personal record! Wow, congratulations!! I hope you did something to celebrate. Three half marathons is really impressive! Its actually my bday too! Happy blog bday! I love your recipes. Happy Anniversary! I started reading your blog when my mother and I decided to change our eating habits. She was recently told that she is in the pre-diabetes stage. Having heard that we were both, rightfully so, startled into realizing that a change had to be made. The diabetic meal plans that we came across seemed to have a fair portion of processed foods and fake sweenteners. That was not the way we wanted to eat. So a quick Pinterest search introduced me to your blog. And we have never looked back. Real food that is wholesome and yet still indulgent? Yes, please! Thank you for sharing your kitchen with us. Wow, that would be startling! The real food route may not always be the most convenient, but I hope you are both feeling healthy and energetic, and finding lots of recipes you enjoy here! Thank you for all the wonderful recipes and tips. My husband and I have been vegan for quite a few years, but until he was diagnosed with tonsillar cancer we didn’t realize how much grain and sugar we were eating. Looking for a new way to bake I stumbled on your blog. It feels good to be able to make and offer to guests delicious and healthy bake goods. I can’t wait to try this cake. Oh wow, talk about a wake up call! How scary. I hope your husband is doing well now! Yes! He is doing awesome! His doctors are amazed. We immediately cut sugars and grains out of our diet and try to keep carbs to 20g daily. Along with supplements and IV C in lieu of chemo and radiation treatments. We are the the healthiest we have been since our teens. Sugar free and grain free should be the way everyone eats! Thank you for coming up with healthy versions of yummy recipes! I Love following your site and our app! Thank you! I hope you enjoy the cake! I need to get healthy and get off all these meds I take. I am sort of new to baking healthier baked goods and treats, and have been enjoying new recipes. This cake looks awesome! Also, I like Simple Mills mixes, but did not know the company has prepared frostings. Yes! The frostings are a newer product from them. They have chocolate and vanilla and both flavors are amazing! I am gluten free , soy free and also love to cook and bake, always looking for ways to make allergy free yummies in the kitchen! Well, I hope you’re finding lots of recipes you love here on the site! Found you through Pinterest. Looking for a healthy dessert and stumbled across your page. The recipes were all interesting and yummy sounding. I signed up for your emails so I could keep up with your new and tried and true recipes. Thanks! I have a dairy allergy, and your recipes allow me to still eats the things I loved before I developed the allergy. And I love that your recipes always turn out well. I’m so glad you know you’re able to eat your favorites again! I have a lot of dietary restrictions so I come to your site for tasty treats that I can actually eat! I hope you’re finding plenty of recipes you love! My fiance and I recently decided to make changes to our diets and eat cleaner. A search for clean recipe ideas brought me here and we’ve loved the recipes we’ve tried and look forward to trying more! Congrats on 3 years. Love the recipes. Always trying to eat a little healthier and you have some that even my kids enjoy. Thanks! Bonus to hear that the kids enjoy the recipes, too! Happy Anniversary Nora and congrats on all of your exciting news this year…baby bake included! 🙂 I reference your website and blog regularly because your ingredients are always easy to source, inexpensive, and your recipes are fool-proof. Plus your personal anecdotes are fun to read. At this point I feel like we are friends! I love to cook but rarely feel like a great baker – especially grain free recipes. But none of your grain free baking recipes have failed me. Instead, I think they taught me how to bake better. Thank you so much, congrats again, and here’s to year 4! Thank you! I love that you’ve followed along for so long and I feel like I know you a little bit too! It’s funny how social media does that 😉 Thanks for always making the recipes look so good in your kitchen! Thank you!! You’re making me blush! Looks delish, but yes I would substitute the oil, probably with a mild olive oil. Always looking for the occasional paleo treat! Yes, you definitely can! Don’t use extra virgin (too much flavor) but I’m sure a light or even virgin olive oil will be fine. Let me know how it turns out! I am a 41 woman doing my best to balance it All while remembering to appreciate the “right now”. A really admirable goal! I know it’s not easy but I hope the recipes here help make it easier. I used to be a tomato mountain customer, and find you through one of their newsletter. I stayed for your creative and delicious (and beautiful!) recipes… I don’t visit the blog much anymore thanks to being a new mom, too, but love getting your newsletters!! Of course, I remember! We’ve talked before 🙂 I’m so glad you found me and congratulations on your new little one! I hope you’re doing well and getting at least a little sleep! Cake looks gorgeous!! And super yummy. Worth the 16 tests for sure!! I love your site because I want to feed my family healthy, real food without sacrificing taste or feeling deprived. We love your recipes!! My name is Ashley and I come here because I love to bake and would one day like to start my own blog. This blog combines my love for baking, knowledge about blogging and my desire to be a bit more healthy. Hi Ashley, I’m glad you’re here! Good luck with your blog! Well being a recent Celiac, I am learning how to bake without the traditional ingredients and you are the best teacher. Thank you and congratulations! That must be a huge change of pace! If you need any help, let me know! I am trying to figure out what is good for me and what isn’t good for me. I gave up white sugar 10 years ago (95% on any given day). I also crave balance in my life. I LOVE to cook, I am at my happiest when I am creating in the kitchen. It’s a long process to figure out what works for your body and what doesn’t (at least it was for me), but it is well worth it. 10 years without sugar? wow! I hope you’re feeling great! This cake looks fantastic! I love looking at your recipes and photographs. I’m a Certified Transformational Nutrition Coach and look for food inspiration. Thank you! Thank you! I’m so glad you found me and I hope you enjoy the cake! Good morning! I found your website via Instacart! I’m going to make your black bean brownies soon! Love the website! Thanks for all your hard work! Oh I love Instacart! I’m glad you found me and welcome! I started coming because my household became Paleo/AIP, and I kept coming back for the amazing recipes and writing style. Thank you for all you do! My pleasure! I’m so glad you keep coming back! Yaaaaaay Happy Year 3! Cheers to many, many more delicious years of recipes. I’m so happy you made the layer cake with the strawberry filling! Seriously, strawberry-filled cake was my absolute favorite growing up. I’m dying to try this recipe! Loving the almond flour + coconut sugar combo…so ready to dig right in! Yayy!! So glad you like it! Thanks, Julia! I suffered for years before finding a doctor who believed my pain was real. I have Celiac Disease and multiple food allergies, so I appreciate the search filters. Especially when I am looking for a fun, new recipe to try out on my friends because a few of them also suffer from food allergies and intolerance. You’re definitely not alone, but it is wonderful to hear that you found a doctor that has your back! Hopefully you have found lots of recipes here that you and your friends can enjoy together! Congratulations on celebrating “3”!! What a wonderful accomplishment! I love your blog and recipes! Thank you so much for sharing!! I switched to Paleo a little over a year ago because of a doctor recommendation for my Fibromyalgia. The change has made an incredible difference in how I not only feel but how I look. Being Paleo has allowed me to bring my pain level from a “7” to a “3” and has helped me to lose over 75lbs. I feel like I have a new lease on life! Thank you! I’m so happy to hear that the change in your diet is really working for you! I enjoy seeing what you’re making! I don’t bake as often as I would like, so I like to live vicariously through you! I’ve only recently come across your site, but already know it’s one I’ll return to again and again. You writing style is warm and funny, your pictures are deliciously clean and simple, and your recipes are everything I am looking for. I have PCOS and am insulin resistant and am recently being much more proactive about keeping my blood sugars in tight control in order to keep myself from any unwanted complications or diabetes in the future. But as a hobby baker, this breaks my heart a little bit. I’ve been struggling to adapt my baking to fit my new way of eating (primal, fat burning, lchf, whatever you want to call it), but have been disappointed. Your blog has given me new hope, and I can’t wait to try some of these recipes! Thank you for these recipes and for sharing your heart with your readers. Thank you so much! I’m so glad you found the site, and I hope you find plenty of recipes that you enjoy eating that don’t derail your new eating plan! I am starting to do the Paleo and GF diet. I am loving it so far and I would be so thrilled to win this. Thank you so very much for the chance. Love the cake that you made. It looks FANTASTIC!! Thank you! And I’m so glad the diet change is working for you! I think I found A Clean Bake because I was searching for a paleo/gluten-free bread recipe, and I’ve been following ever since because I love ALL your recipes! I also love your writing, which is a nice added benefit of following 🙂 Thanks for doing what you do! Happy anniversary! I love your site because I love to cook healthy food! I’m always looking for clean recipes and have the biggest sweet tooth so healthy options are definitely a priority! Thank you! Ah, we are in the same boat as far as the sweet tooth is concerned! I come here because baking helps me de-stress, so I like to do it often but I don’t want to fill my house with unhealthy food. Your recipes are healthy and delicious! I hear you on that! Isn’t it nice to have better-for-you treats around? I am currently entering into my clinical year of vet school and have been spending the last three months trying to stay prepped for each week to keep my diet on track. In addition to my health, this is especially important for me in order to stay focused and energized to allow me to meet the demands of my curriculum. I’ve been following you on Instagram for over a year and have found myself on your site time and time again using your beautiful yet simple recipes to help complete my meal plans. Your yummy recipes have made staying on track so much easier because they taste GOOD! 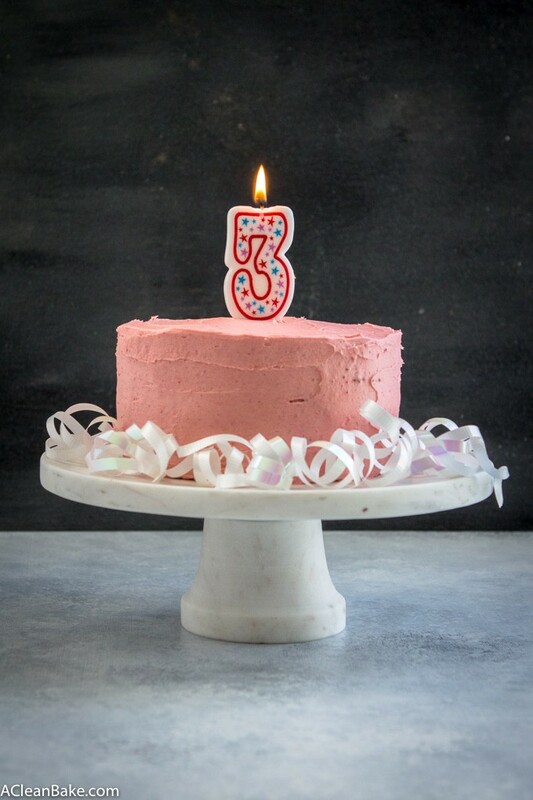 Thank you for continuing to share your awesome creations and a big congratulations on your 3 year anniversary! You’re welcome and I am SO happy to be helpful! Thank you! I’m happy to hear that diet changes are helping you! I have problems to lose weight because of my hypothyroidism and that causes many other health problems to me. I’m trying to do a paleo diet, and while searching, I found your blog. I like it because you have lots of information and recipes that are very easy to follow. Thank you! I’m glad you found me! I follow you because of your beautiful pictures of how to eat fun clean eating. I try to bake and cook food in a healthy way and you help me with your fabulous recipes! Thanks, Liz! That’s great to hear! I love these recipes because I bake and cook a lot for my friends at college, and introducing healthy but tasty recipes is easier when I have a good guide!! Wow, your friends are lucky to have you to cook for them! I am here because I love paleo cooking! I love your ideas and your recipes! Your cake looks amazing and makes me want to go make it now! also love Simple Mills and Now brands! This is amazing!! Just recently I have found that I have many food allergies so now I am peanut free, dairy free, corn free, soy free, grain free, legume free…yep crazy right!! 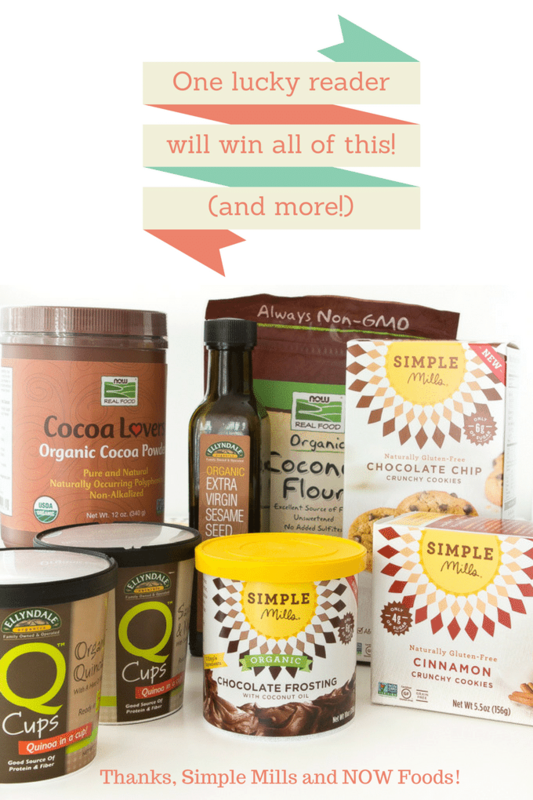 I absolutely love Simple Mills but have never tried NOW Foods products. 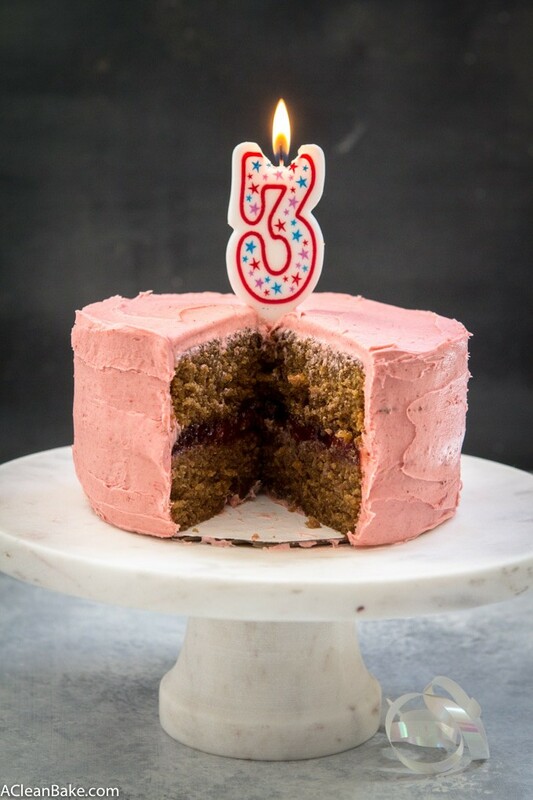 I am always looking for blogs that have great recipes that I can actually try and this cake….Omg I wish I could eat it right now lol. Keep up the amazing work! Yes, the ingredients lists can be pretty daunting at first, but you’ll get used to it eventually 🙂 I added a little shop to the blog (https://acleanbake.com/start-here/stock-your-kitchen/) where you can find everything you need! Hope you find other recipes you enjoy here! That’s awesome to hear! I’m so happy you’re enjoying everything you’ve made! Thank you so much for everything you do! I stumbled across your blog awhile back and fell in love. I’ve been following you on Instagram and reading your blog every since. Love your clean and accessible recipes. I’m so glad you found me! Thanks for following (here and on instagram)! My niece and nephew are gluten free and I’m always looking for recipes to make for them! Nora, I can’t get enough of your recipes! I started coming on your site because I wanted to lose weight while still enjoying food. I love to bake. I love to cook. I love to try new things–you’re recipes have actually helped me get 21 lbs down. I know it might not seem like a lot, but for someone who is sedentary all day; it is. My daughter also is allergic to dairy. Your recipes have been a life saver. She’s in college and baking and cooking your recipes have saved Me from having to purchase those expensive meal plans at her school. She’s also been losing weight and honestly it’s because we have changed our eating habits and cooked and baked many of your recipes. Thank you, for the love, effort, passion, and time you have put into your recipes and website/blog. I will continue to make these recipes and look forward to new ones. I find the hardest thing while eating paleo is my sweet tooth so I’m always looking for recipes or products that work with the plan. The cake looks amazing! Hi, Happy 3rd Anniversary! I am a celiac with a diabetic husband. I am always looking for recipes that will work for both of us. So lower carbs are a plus. I love looking more than actually making most of them. I found you either through Pinterest, or another blogger. Hope you have many more good recipes. I just discovered you, but I hope to find yummy healthy recipes. I like to bake and I want to find tasty receipes that are also clean. I can here because of a post I saw on Instagram from Now Foods. It was a picture of a slice of cake with pink icing and I just had to know what it was. I’m a sucker for ANYTHING with pink incing. It’s something about the pink icing that makes me feel special. And it’s cute! Then, to seal the deal, I saw three magic words, “Paleo”, “Strawberry”, and “Cake”. Lol! So, I pinned this to my paleo sweets board and now I will one day copy this recipe. You have a really cool site and Happy Anniversary! If you want to visit my paleo sweet board on Pinterest, please feel free. I came here because that cake looks delicious (It caught my eye)! My kids and I have multiple allergies and intolerances which makes baking a challenge. I also like checking out new products! Congratulations! I’ve been into healthy foods before it was so popular, and boy oh boy I love your recipes – so good and so good for you! I’m looking for healthy recipes that taste and look great! I have IBS and I am being tested for other health issues… I am trying to find recipes to help me feel good about foods I eat. I have lost 100 lbs. over the last year and enjoy your healthy recipes. First off Congratulations Nora! Such a happy moment! I think I have been following you almost this entire time! My name is Maria Burgio (maweeah) on Instagram and I am a Graphic Designer living in the Central Valley in California. I was brought here while searching for clean recipes and paleo recipes without dairy. That was almost 3 years ago and I’ve made so many of your recipes! I a make your grain-free chocolate chip cookies almost every week. My clean eating sweetheart told me this weekend that they are the best cookies he’s ever tasted! That was the third time I’ve made them for him alone and they are devoured within hours. No only am I dairy sensitive, my boyfriend is completely lactose intolerant and has a very sensitive tummy. Your recipes are so delicious and don’t make us feel deprived. That’s what brings me to A Clean Bake. From the Deep Dish Chocolate Cake, to the grain free chocolate chip cookies to the Sweet Potato and Carrot Latkes – we are NEVER dissapointed! Your recipes keep us healthy and satisfied. Our birthday’s are both in May and I cannot wait to make us this cake to enjoy together. Thank you for spending so much time in the kitchen experimenting so we can all eat so delicious! A dairy allergy a few years ago threw me for a loop. I come here when we want a delicious dessert! I love to bake, but I also am into fitness and clean nutrition. Usually those two are mutuallly exclusive. I love finding new recipes where I can still bake and eat clean. Thanks! Hello Nora, hope you are well. Problem in life is I can not live without scrumptious baked goods but of course they are not healthy for me. This is where you come in my life, Nora, Thanks to you I can make a cake and eat it too. Thank you for the healthy recipes, my kids and I love all of them but our favorite is the 5 ingredient peanut butter cookies 🍪. Can’t wait to try this cake. Just discovered you tonight. Looks yummy! I like good healthy recipes! Congratulations! I’m always looking for new recipes with less sugar and clean ingredients. I’m excited I found you on Instagram, and I can’t wait to try out your recipes. The cake looks amazing! My winnings were delivered the other day. Thank you ,thank you, thank you! The cookies were gobbled up by the kids. They haven’t had store bought cookies in a long time. I need to tell you how awesome the infused coconut oils are! The buttered infused one is awesome for popping popcorn on the stove and baked goods. But I am in love with the ghost pepper infused oil. I am using it for every recipe where I want a bit of heat and Smokey flavor. From pinto beans to Thai dishes. I am really not comfortable with canola oil. Couldn’t I use coconut cooking oil? The one that stays liquid? Hi Rebecca! I understand. It would actually be better to use grapeseed oil. Coconut oil can make the cake a little too dense and heavy. Hey! Just wanted to let you know that this recipe turned out wonderfully! I even made it vegan by using flax eggs and it totally worked. I also ignored your coconut oil note and ended up using it and it was sooo so good. I will definitely make again. Thank you!! It’s great to know that this works with flax eggs! Nora, I would love to make this cake. It looks absolutely delicious! Are the nutrition facts as stated per serving correct – 314g sugar in a serving? Also, your pictures are just beautiful but I was wondering why the vanilla cake doesn’t look lighter in color like most vanilla cakes. Thanks. Hi Sharon! That’s for the entire cake. I just refreshed the nutrition info, so it should show nutrition for each (generous) slice. It’s still not diet food! Feel free to cut 12-16 slices instead of 8.